On December 2, 2014, Jewish culture was celebrated with a special meal served in the Den at Indiana University East, and the playing of the Hanukah dreidel game. Hanukah begins the evening of Dec. 16 and lasts for 8 nights. Rabbi Yossi Greenberg, the Chabad Rabbi at Miami University in Oxford, Ohio was present to answer any questions about the meal, Hanukah or Jewish traditions in general. The meal consisted of traditional kosher style items such as falafel, kugel, and latkes. 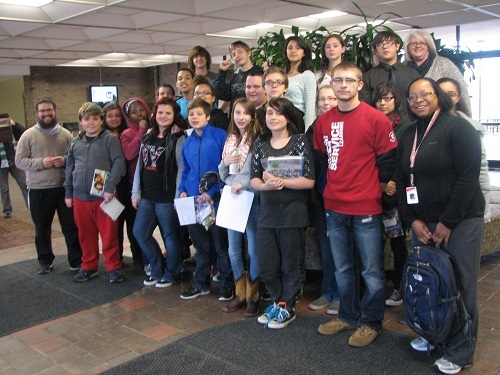 Eighth graders in Tiauna Washington’s class from the Early College program at local intermediate school Hibberd attended the event as well. Although the majority of the eighth graders had never eaten Jewish cuisine, most of them liked all of the new types of food. After clearing his entire plate, Jordan said, “It was good, filling, and some of it was even a little spicy.” Another eighth grader, Mike, had eaten some of these traditional types of Jewish foods before. He said, “I liked all of the food for the most part. A lot of it was pretty good.” Alexandra, an IU East student volunteer of the event, said her favorite part of the meal was the sweet potato dish. After the meal, the students had the opportunity to play the Dreidel game. The game began during the times of oppression of the Jews by the Greeks. Jewish children studied the Torah in hiding, since study of Torah has been outlawed, and when soldiers were approaching, they would pull out spinning tops to show that they were simply playing a game. 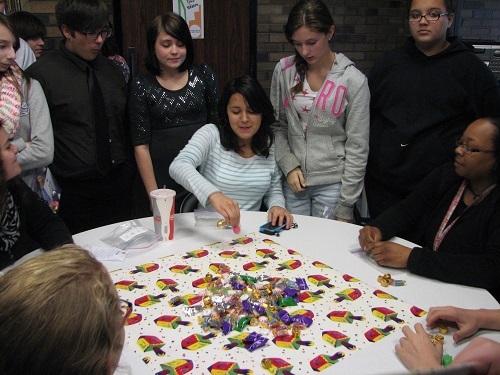 The intermediate students enjoyed playing the game. 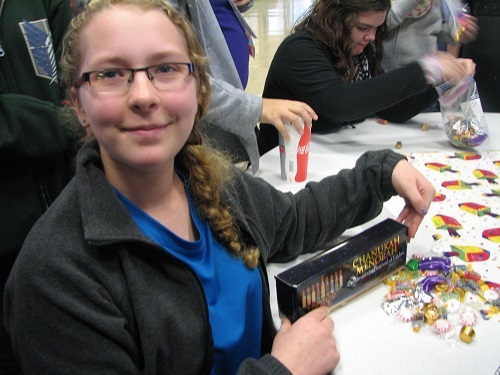 The champion of the Dreidel tournament, Taylor, said that some of her extended family are Jewish, so she had played the game a lot previously. However, when asked what the trick was, she said there wasn’t one. For her grand prize, Taylor got to take home a travel Menorah, a smaller version of the traditional candelabrum in which one candle is lit each night of Hanukah. I spoke with Rabbi Yossi about the event and his experiences as a Chabad Rabbi. He said of the event, “The children are amazing, smiling, happy, having fun. This diversity event was a wonderful opportunity.” Yossi has been a rabbi for the last four years. He moved from Brooklyn, New York to Ohio two years ago. He said studying to be a rabbi was a lifelong process, but he did attend Rabbinical College in New York for two years. While preparing to become a rabbi, he had the opportunity to travel to various places. Among them were Ukraine, Israel, Canada, and quite a bit of Europe, including England. Rabbi Yossi said he had probably first played the dreidel game himself when he was around two since the game doesn’t really have an age requirement, and all can play. For everyone who wants to learn more about Jewish culture or Judaism, IU East has lots of resources. Books available run the gamut of history, culture, and religion. Titles include Jewish History, Jewish Religion: The Weight of Three Thousand Years by Israel Shahak, Turning Points in Jewish Intellectual History by David Aberbach, Jewish Social Contract: An Essay in Political Theology by David Novak, Understanding Judaism by Jeremy Rosen, Jewish Philosophy in a Secular Age by Kenneth Seeskin, Midrashic Imagination: Jewish Exegesis, Thought, and History by Michael Fishbane, and New Perspectives in Theology of Judaism by Shubert Spero. And we have a LibGuide which serves as portal to a wide variety of resources and multimedia. We even have children’s books to share with younger learners, including While the Candles Burn: Eight Stories for Hanukkah by Barbara Diamond Goldin and A Jewish Holiday ABC by Malka Drucker. There’s something for everyone! Do you have any questions? Share them with us at iueref@iue.edu!